It had been a while since I had flown, so to get current, I booked some time with Simple Flight CFI Extraordinaire Al Waterloo. Our goal was to go out and do a biennial flight review flight (BFR). However, when the Saturday arrived the weather was not cooperating and the ceilings would not allow for us to perform some of the maneuvers planned for the BFR. I was tempted to scrub the flight, but we decided to meet at the airport to see if we could find a way to salvage the day. Al suggested we walk through the PAVE & TEAM Checklists, two checklists I had heard of but never used, so Al walked me through them. P = Pilot: I am familiar with the I'm Safe checklist and that can be applied here. Basically P is used to determine if I, the pilot, am in the right shape to fly. It is also the time to look beyond health but assess my pilot capabilities against the aircraft I plan to fly, the weather conditions we are expecting, etc. A = Aircraft: Basically assessing whether this aircraft is the right aircraft for the mission. Is it airworthy, fueld properly, etc. V = EnVironment: What is the weather forecast for my airport, my destination an enroute. In addition to weather it includes evaluating terrain, TFRs or NOTAMs that could cause concern. E = External Pressures: Are there external pressures that may effect ability to make sound judgements. Is Get-there-itis a concern? Am I worried about letting a passenger down if we don't fly. Basically evaluating any external pressures. T = Transfer: Should the risk decision be transferred to someone else? E = Eliminate: Is there a way to eliminate the hazard? A = Accept: Are the risks posed acceptable? M = Mitigate: What can you do to mitigate the risk? That morning the entire Midwest was under a low cloud ceiling which was broken at around 1,600 feet and all local airports were reporting Marginal VFR (MVFR). We decided our goal would be to fly to Milwaukee from Chicago Executive for lunch and back. So we did a thorough weather brief in ForeFlight then made a go/no-go decision utilizing PAVE in conjunction with TEAM. 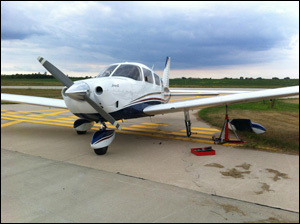 Pilot: I had not flown in a few months, we decided that if it were just me that day I would likely have eliminated the risk by scrubbing the flight, but on this morning I would transfer some of that risk to Al my CFI and Instrument rated pilot who could file an instrument flight plan if conditions deteriorated. Airplane: We determined the aircraft was absolutely up to the task and was not effected by the weather. So there was little risk, so we accepted the situation. Environment: We determined although we had low ceilings there was no issue with terrain. We also had a several airports we could divert to if weather conditions deteriorated. So we accepted some risk. External Pressures: We determined there was no need to complete this flight and we had no external pressures that would negatively impact our judgement. So we again accepted this. After a thorough review we determined we could salvage this Marginal VFR day and go flying. Turned out to be a great day of flying and camaraderie. Al and I had a smooth, low flight with fine visibility up to Milwaukee. My first visit to Milwaukee was a nice one, the controllers were friendly and traffic was minimal. We grabbed the crew car and enjoyed a great lunch at Cafe Centraal. We had hoped maybe the weather would improve and give us higher ceilings to perform some stalls, emergency procedures, and other maneuvers. Unfortunately, they did not, but the return flight was also smooth an uneventful. In the end we used the PAVE and TEAM checklists to allow us to squeeze a great day of flying out of a Marginal VFR day! Quick, name the most famous female aviator of all time? Of course your answer was Amelia Earhart, a revolutionary figure in aviation with a tragic story to boot. However, I contend that Jerrie Mock should have been in your decision set. Wait ... Jerrie Who? In 1962 Mock, an airport manager in Columbus, OH, and a 500-hour private pilot, was looking for a challenge. Her husband suggested, "Why don't you fly around the world?" and her dream was born. Two years, 250 hours in the logbook, and an instrument rating and Jerrie Mock was ready to make history. She was not alone, however as she was racing against time and competitor Joan Merrian Smith to become the first woman to successfully fly solo around the world. During her 22,860-mile journey Mock battled fatigue, equipment problems including radio malfunctions, rough engines, and electrical fires. The weather was another complication with legs flown through icing conditions, sandstorms, thunderstorms, and excessive heat all adding to her challenges. There were also moments of pilot error; on March 31, 1964 while enroute from Algeria to Cairo she misidentified an airport, accidentally landing at a secret military airport resulting in hours of interrogation before she could continue her journey. March 19, 2014 will mark the 50th anniversary of the start of her historic flight. 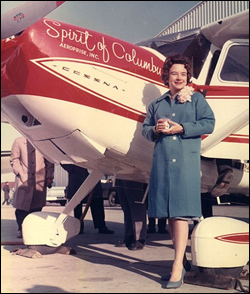 Over the next 29 1/2 days, she logged 158 hours in her 1953 Cessna 180 Skywagon nicknamed "The Spirit of Columbus" enroute to the record books. Upon returning to Columbus on April 17 she had set two official records according to the International Air Sports Federation (FAI): Female record and speed around the world. Additionally, President L.B. Johnson awarded her the Gold Medal of the FAA, and the FAI presented her with the prestigious Louis Blériot Silver Medal. The story of Jerrie Mock, Three Eight Charlie, was originally published in 1970 but had since gone out of print and was very difficult to find. As part of the 50th celebration of this flight, Phoenix Graphix Publishing Services has released a new, colorful edition of Three Eight Charlie and it can be purchased on their website. I originally read her book in 2006 and look forward to re-reading her historic tale. I highly recommend her story, not only a tale of an amazing aviation accomplishment but balanced with interesting stores of her time on the ground at each checkpoint. Asked now about her accomplishment Mock humbly commented, "I was just having fun, it was no big deal." Shortly after completing her flight she had stated, "I hope...that somewhere here and there my just doing something that hadn't been done will encourage someone else who wants to do something very much and hadn't quite had the heart to try it." I sure hope revisiting this accomplishment will help inspire a whole new generation! Amelia Rose Earhart (no relation to the famous Amelia Mary Earhart who disappeared July 2, 1937) is part of this new generation of inspired aviators. She will be attempting a flight around the world in a Pilatus PC-12NG later this year. I asked her about her inspirations and she commented, "Jerrie was clearly ahead of her time when it came to her adventurous spirit and passion for flight, and she serves as the perfect example for young women looking forward to a future in aviation. Unfortunately, we are still right around 6% when it comes to the amount of pilots that are women, but I am confident that we can increase those numbers over time. Jerrie led by example, not only telling others to go out and seek their strongest passions, rather she lead by showing us what a life filled with flight can lend toward adventure. Jerry is a true pioneer and it is an honor to have her as a role model." 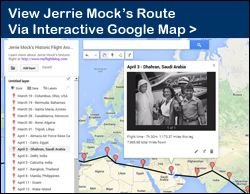 I am hopeful the 50th anniversary of Mock's flight and Earhart's 2014 adventure will inspire more aviation adventurers and increase interest in aviation for girls around the world. Be sure to check out this Jerrie Mock photo gallery from the Columbus Dispatch and the official Three Eight Charlie website. 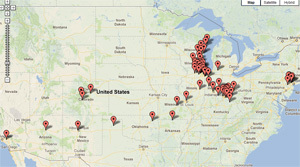 Also follow Amelia Rose Earhart's around-the-world flight at FlyWithAmelia.org. I think all pilots, subconsciously or not, gravitate towards airports. We can't keep our eyes from focusing on overflying airplanes and following them to airports, or at least that is what I do. While visiting San Francisco this past weekend I noticed several airplanes flying over the various sites of that wonderful city. I knew they could have flown from one of many nearby airfields. 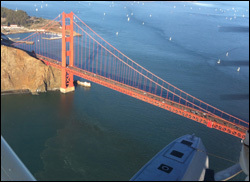 In fact just a few years earlier I had flown with Jason Miller out of San Carlos (KSQL) and enjoyed a flightseeing tour along the bay and Pacific coast including a flyby of the Golden Gate Bridge. What caught my eye on Friday was a beautiful de Havilland Beaver on floats flying low along the bay. I wondered where it was based before getting distracted by my heavy breathing as I hoofed up another sweat-inducing hill that the city is known for. The next day I rented a bike and rode from San Francisco over the Golden Gate Bride to Sausalito. My goal was to visit Old Mill Park, just a few miles past Sausalito, to check out world's tallest trees. On the map I was provided was a reference to a float plane base, which I could not pass on checking out during my adventure. The ride was beautiful and has become one of my favorite ways to enjoy San Francisco. Even better then the ride was the encounter with Seaplane Adventures. I pedaled up to their dock and popped in and asked if they would mind if I walked out on their dock to check out their airplanes. Floating next to the dock were a Cessna 172 on floats and the de Havilland Beaver I had seen the day prior. While talking to the owner, Aaron, he asked if I wanted to go for a ride. He was just getting ready to take another couple up for a ride and had space for one more. I quickly tossed aside my goals of spending a day in nature for an opportunity to fly above San Francisco in one of my favorite airplanes. This would be my second flight in the Beaver, My wife and I were blessed with the opportunity to land on a glacier in Alaska about ten years ago and still remains one of my fondest aviation experiences. I was both disappointed and pleased to learn that one of the other passengers was a pilot. Disappointed because as a pilot he too had interest in the right seat and had requested it. However, I enjoyed the opportunity to talk aviation with both Aaron and Les and his wife who had flown down to San Francisco via private aviation (Hat tip to Open Airplane's Rod Rakic*). My words will never be able to do justice to the views we enjoyed, nor for that matter do these pictures (All I had was my iPhone). But, I thought I would share a few of the videos and photos I took and compiled below to give you a feel of what it is like. If you find yourself in San Francisco be sure to check out Seaplane Adventures. I guarantee they will take great care of you. The owner mentioned in addition to flightseeing they also offer floatplane training, something I might consider next time I am in town. *If you have not read Rod Rakic's blog post "Why I Don't Talk About 'General Aviation' Anymore", check it out. I plan to use the term Private Aviation instead of General Aviation more often. Typically my annual review is focused on the hours logged. This past year I feel I was as invested in general aviation as I have ever been, that being said my hours spent as PIC don't necessarily reflect that. Coming off a strong year in 2012 where I logged nearly 40 hours and visited nine states in General Aviation aircraft, 2013 looks weak at just 11.5 hours logged as PIC. More than ever I had other priorities that conflicted with flying including family, work and dedication to Ground Effect Advisors an organization I co-founded in 2013 which is dedicated to helping create more flying clubs around the country. In 2014 I hope to find more balance that lets me increase the hours flown while also not giving up much time from families or career aspirations. I continue to toy with the idea of dedicating time and resources to earn the Instrument Rating in 2014. In February I co-founded Ground Effect Advisors with Al Waterloo, Louis Bowers and Marc Epner. We launched StartAFlyingClub.com and the first ever flying club scholarship. In May we announced the winner of the scholarship Zach Piech (SP) and since then he has launched Cape Fear Flyers which now has 10 members and two aircraft! I look forward to helping build more flying clubs in 2014. In March I proved to myself that I could carve out a few hours away from the office and log a true $100 Lunch by packing a peanut butter and jelly and doing a few laps around the pattern. I plan to reuse this tactic in 2014 to keep fresh. Probably the most fun day of aviating was also the last day I flew in 2013. In August I shared the plane with friend Louis Bowers and we flew down to the press day for the Chicago Air and Water Show. Not only did we get some PIC time in the Piper Archer we both logged some time in the T-6 Texan thanks to Team Aerostars Flight Team. After enjoying some aerobatics and nice views of the city we did some more general aviation aviating, and I experienced my first flat tire in a GA aircraft. The day did not go as planned but offered a fun learning experience. In December I was honored to be included in a list of 24 General Aviation Up and Comers selected by General Aviation News and their readers for my contributions with Ground Effect Advisors and this blog. The article can be found in their December 20th issue and viewed online. This fall and winter worked dominated and I was not able to get out to the airport much. The break from flying represents my longest break from flying. Something I am hoping to rectify in the coming weeks. Aviation Adventures come in both the planned and unplanned variety, as illustrated by my most recent flight. Every August since 2005 I have covered the Chicago Air & Water Show for MyFlightBlog and a few other media outlets but in all those years I had never flown into the event at Gary International Airport. So a fellow club member and friend, Louis (from Sky Conditions Clear), decided we would make a day of it by flying down in the Leading Edge Archer, then enjoy talking and flying with some of the acts for the Chicago Air & Water Show then finish the day logging more time in the Archer. On a perfect VFR Thursday morning we preflighted the airplane then launched Eastbound from Chicago Executive. Once over the lakeshore we turned south and enjoyed a beautiful view of Chicago as the sun shined on the windows of the skyscrapers. I elected to pick-up flight following for the trip down the lakefront but despite the great weather I believe they only notified us of one other aircraft that was taking advantage of this beautiful VFR day. The flight down was uneventful but enjoyable. We taxied down to Gary Jet Center where we parked the Piper Archer right next to Team Aeroshell's four T-6 Texans. Louis and I spent the first hour or so of the media day walking the flightline checking out the various aircraft including Sean Tucker's Oracle Challenger Bi-Plane, Art Nalls' L-39 and Sea Harrier, an A-4, and a variety of T-6 Texans. Shortly there after we met Harvey Meek the Team Lead of Team Aerostars, a locally based aerobatic team that team that despite being in existence for 12 years were making their Chicago Air & Water Show debut. I had spoken with a fellow member of the team leading up to the show and knowing that Louis and I were pilots he ensured us he would get us up in their aircraft to learn about their team and the performance of their Yak-52s. Having never flown in a Yak-52, I was eager to check it out. We conducted a brief flight briefing where we discussed the mission objectives which was to fly along the lakefront to Chicago so a Reuters photographer could take some shots of a Team Aerostars airplane with the city skyline as a backdrop. After that we would return to the airspace West of Gary for a brief aerobatic demonstration. Sitting backseat in Harvey's aircraft he informed me he would let me take the controls shortly after the flight and lead the flight up the lakefront. True to his word, as we exited the Gary airspace Harvey gave me airplane. It was an easy plane to fly, and felt quite responsive. After achieving a successful photo run, including this shot featuring Harvey and I and the Chicago skyline, we headed back South to get inverted. Back near Gary where there is more airspace for aerobatics Harvey helped me experience the aerobatic performance of the Yak-52 through a series of maneuvers including loops, barrel rolls and a Cuban Eight. After my flight Louis got to take a backseat for his flight with Team Aerostars. As fun as the flying was we equally enjoyed getting to meet the Team Aerostars pilots and their support staff. We learned that the all fly commercially by day, aerobatics on the weekends and several of them even live in fly-in communities, pure aviators at heart. By all accounts it was a successful day full of aviation adventure, little did we know how much more adventure we had ahead. After the airplanes were all tied down or put to rest in the hangers and it was clear there were no more rides to be had or aircraft to ogle at, we fired up the Archer III. Louis would be the Pilot in Command for the return flight. Our plan was to visit a small uncontrolled airport nearby for a few landings then go VFR over the top of Midway then fly south and east of O'hare then come up the from the south to the north on the west side of the O'Hare airsapce on our way back to Chicago Executive. After four near perfect landings (video does not lie) at Bult Field by Captain Bowers we began a final taxi back to the end of the runway to prepare to for the return flight to Chicago Executive. Nearing the end of the runway Louis asked if I felt a shake, which I had not. He said he was feeling a vibration in the rudder pedals and then a pull and quickly made the correct assessment that we had blown a tire. In an excellent example of airmanship Louis immediately stopped the aircraft, and shut it down right on the taxiway. After the blades settled I got out and confirmed we had a left main tire flat. Louis was busy trying to determine what happened while I started to wonder what in the world we were going to do to get the aircraft back, or get ourselves back to Chicago as it appeared there would be little support at this sleepy airport. We made a few calls and learned that there in fact was a mechanic based at the field that is typically there usually three to four days a week. So walked nearly a mile (5,000 feet) down the runway to the Hangar were we were told we might find him. As we approached two gentleman in the limited baggage space of a Cessna 152, they hoped out of their existing project to hear our plight and quickly offered to help. Randy, the owner of Aircraft Professionals, took his tug out to examine the wounded bird. Shortly after he returned with the great news that he believe he would be able to change out the tire, right there on the taxiway. He and his partner loaded up a truck and a golf cart and we drove back to the plane to get to work. This was my first experience with a flat so it was entertaining to see how it was handled. Randy, propped up the plane and he and his technician removed the wheel pant and wheel. After initial inspection he believed the tire was in great shape and that it was a tear in the tube but promised a more detailed check back at the hangar. We raced a golf cart and an aircraft tug back to the hangar where he confirmed the tire was in great shape and that likely a pebble had been inside the tire rubbing up against the tire tube and it finally broke through causing the flat. Louis was relieved that this was further proof that his landings and taxing skills were not the cause, I never had any such doubts. Thirty minutes later the new tube was installed, the wheel fairing was replaced and we did an extended taxi to confirm the tire seemed good and balanced. We gave a big thanks to the guys at Aviation Professionals and promised to come visit there field again after such great hospitality. A few hours behind schedule, and with the airplane due for another rental we scrubbed the VFR over Midway and headed back past Gary up along the lakefront where we took in a lovely sunset over the city and watched the lights come on at Soldier Field in advance of a pre-season game. Returning to Chicago Executive we both agreed that it was a spectacular way to spend the day. We both logged PIC time in the Archer, dual time in the Yak-52, got to perform aerobatics and learned how to handle an unexpected adventure like a flat tire on the taxiway. Aviation adventures are fun no matter what form they come in. Jim Cornelison well known for his emotional renditions of the National Anthem at Blackhawks games will skydive into the Chicago Air & Water Show. Cornelison, will be be the guest of the All-Veteran Parachute Team and join them for a tandem skydive to kick off the 55th Annual Chicago Air & Water Show. After landing at show center at 10am he will sing the National Anthem. Jim Cornelison is in his fifth season as the Chicago Blackhawks' full-time national anthem singer, having made regular appearances singing the anthem at the United Center since 1996. He has performed nationally and internationally with some of the biggest names in opera, such as Plácido Domingo and Zubin Mehta. Known as a heroic tenor for the dark color of his voice but ability to sing in a tenor range, he has sung with opera companies in Bordeaux, London, Brussels and San Francisco, among many other places. The All-Veteran Parachute Team, formed two years ago, will be making their Chicago Air & Water Show debut this weekend. In addition to giving Cornelison a ride to the show the team will make multiple jumps at each show. Each jump will allow them to showcase their accuracy and precision skills landing on a target at North Avenue Beach (Show Center). The team is comprised entirely of combat veterans, active and retired service members. Each of the members who will be jumping over Chicago are former U.S. Army Golden Knights and have been deployed in support of various conflicts over the past 25 years. According to member Dave Herwig, "Our goal is to expand the team to have at least one member from each of the five branches of service." Herwig explains that, "The goal of the team is to give back to the American public for their continual support of our men and women who defend our freedoms each and every day. Every jump is dedicated to every veteran from all branches and all conflicts." The team recently teamed up with Nashville Recording artist Jamie Tate who will sing "I'll Give My All" during one of their jumps each day. Herwig says, "It will bring on goose bumps and raise the hair on your arms, it has been a real crowd pleaser hearing her sing while team leader, Mike Elliott, descends on the crowd with a huge American flag. You can learn more about the All-Veteran Parachute team on their website, via twitter and Facebook. Learn more about each of the acts at the 2013 Chicago Air & Water Show in our Ultimate Guide to the Show. Think you will miss out on the roar of jets this year at the Chicago Air & Water Show? Think again. 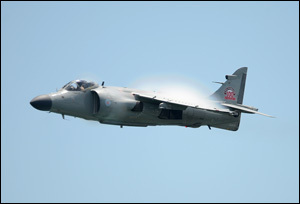 Art Nalls plans to pilot the fastest aircraft in the 2013 Chicago Air & Water Show, the Sea Harrier FA2. Nalls shared with me what we can expect from his Harrier demonstration. "My demo is slightly different from the USMC Harrier demo. First, I'm a bit faster. I can easily reach over 600 knots in my first pass, which is over 700 mph. The Marines can't go quite that fast". Nalls continued, "Second, I'm licensed as an aerobatic pilot, while the Marines are not. I plan to do rolls, Cuban 8's, 4-point aileron rolls, as well as the Hover. In the hover, I will back up, go sideways, and pirouette the airplane in the hover. Providing the winds are within very tight limitations, I will also "Bow to the Crowd" which is to point the nose of the airplane toward the crowd, and point the nose down to approximately 45 degrees." Built by Hawker-Siddley, hist Sea Harrier was the second one ever built and is the oldest surviving one. Those at Show Center will be able to see the V/STOL, Vertical and or Short Take-off and Landing capabilities of this unique aircraft. Nalls is the only person in the world to privately own an airworthy Sea Harrier. A U.S Naval Academy graduate, Nalls logged over 900 hours in the AV-8A variant of the Harrier including over 400 shipboard landings. Nalls is also a graduate of the U.S. Air Force Test Pilot School at Edwards Air Force Base. He has flight time in approximately 75 different aircraft including the B-52, C-141, C-130, A-7, A-37, T-38, F-4, F-5, F-15, and F-16, and F-18. When the opportunity to own a Sea Harrier came available he jumped at it and has been showing off the aircraft since. In addition to showing off the performance of the Sea Harrier, Nalls will be bringing a Czechoslovakian Advanced Jet Trainer, the L-39 Albatross to demonstrate as well. He or a fellow pilot, Joe Anderson, will be showing off this aircraft during the show. The L-39 quickly became one of my favorite aircraft when I had the chance to spend an hour with Gauntlet Warbirds (Aurora, IL) in their L-39 performing aerobatics. Greg Morris of Gauntlet Warbirds explained, "After entering production in 1972 the L-39 had great success as a jet trainer and light attack aircraft throughout the world, at one point being used by nearly forty air forces. It is still flown by numerous militaries including Russia, Ukraine, Thailand, the Czech Republic, and Egypt." The aircraft has a maximum speed of 490 knots (.8 mach). Although sequestration will prevent active military aircraft from performing at the 2013 Chicago Air & Water Show you can still expect to hear a few jets roaring overhead Chicago. The majority of my flight time this summer was spent getting checked out in the Sky Arrow, a fun little two seat pusher aircraft that had joined Leading Edge Flying Club about a year ago. Unfortunately, soon after getting checked out in the aircraft I learned that the owner was moving across the country and would be removing the airplane from the club. Yesterday in Chicago we were blessed with ideal flying conditions. So I rented the club's Piper Archer III, the aircraft I have been flying most frequently over the past few years. It was fun getting reacquainted with an old friend. There is definitely something special about checking out new aircraft and the learning that comes with it. But, there is something equally special about knowing an airplane well. It makes the flying experience that much more about the enjoyment of the flight as your mind and body know exactly how to get the desired performance from the aircraft. Last night there was no fumbling for switches or looking all over the place to find something as I was experiencing in the Sky Arrow. Last night it was about enjoying a perfect night taking in a perspective of the world far too few get the opportunity to enjoy. I am looking forward to turning the Hobbes on the Archer on a more regular basis for the remainder of this year. There is a strong discussion going on over at AirFacts in regards to a recent article asking "Are airshows dying?". The sad reality is that I think there is little to debate, interest in airshows is in fact declining. There is a lengthy list of reasons that may contribute to that including a decline in the pilot population, weak economy and the grounding of military demonstration teams as a result of sequestration to name a few. A source I often look to when trying to establish a trend is Google Trends. Sadly, as you can see from the charts below there is an indisputable decline in interest for airshows, if search traffic is used as an indicator. AirVenture, America's largest annual gathering of aviation enthusiasts, widely considered the largest airshow in the county, has seen modest declines if you rely on their data which shows a 12% decline from 2009 (578,000 attendees) to 2012 (508,000). However, the picture is more bleak when you look at the Google Trend which shows a peak in July 2006 declining to nearly half the search volume of 2006 in 2012. With Airventure 2013 closing in a just a couple of days it is unlikely that enough searches will come in during the final days to improve the 2013 trend. As Airventure is more about experimental aircraft and general aviation it should be of note that the decrease in interest in the show this year is likely not drastically effected by sequestration. The Chicago Air & Water Show which is just around the corner will surely suffer serious interest and attendance declines without the Thunderbirds headlining this year. The Google Trend shows that current interest is below where it was just five years ago. I think this show which historically relied heavily on military demonstrations will be adversely effected by sequestration. It will be very interesting to come back to this report in a few weeks to see what the 2013 search volume was like for the Chicago Air and Water Show. The most concerning trend might be for the generic term "Airshow" which received peak searches in 2004, with a nearly equal volume of searches in 2006 but a sharp decline from that year forward. Although, 2012 saw more "airshow" searches then 2011 it still represented half of the volume searched in 2004 and well through the 2013 season search volume is half of 2012 which may be the effect of sequestration showing itself. The term airshow has enough search volume that Google is capable of providing a forecast which is as disturbing as the historical trend. (Please note: Forecast is not show in the embedded trend below, click on full report and select trend to view). I think this data clearly shows that interest in airshows is declining. The questions is what if anything can be done about it? The 2013 Chicago Air & Water Show will feature several new acts in 2013 including the Geico Skytypers. The team will fly an 18-minute low altitude precision performance showcasing the performance of their six SNJ-2's, best known for training the greatest generation of pilots. 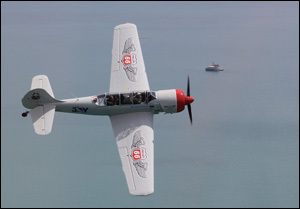 The SNJ-2 is often identified as the T-6 Texan and is an aircraft Chicago Air & Water Show fans should be familiar with as it is flown by Team Aeroshell and also by several other performers over the year. 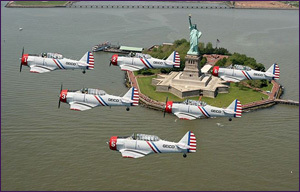 The Geico Skytypers will be flying the largest formation of these aircraft in the shows history. The Thunderbirds who were scratched from this year's show are known for their Delta Six formation. The Skytypers will start their performance showing off their precision flying with there own Delta Six formation before then splitting off into a diamond formation of four aircraft with two opposing solos. 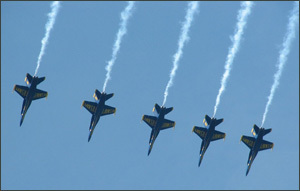 They will then join up again to finish their performance as a six team delta formation. The Skytypers take skywriting to whole new level. Skywriting is traditionally done by a single aerobatic aircraft that writes a single work in script in the sky before it often dissipates quickly. The Skytypers have taken the 1940s trainers and tricked them out with glass cockpits and a computer system for printing messages in the sky that can be read from over 15 miles. Steve "Sting" Kapur, a team pilot and marketing officer, explained that a computer synced with each aircraft helps them to write messages as long as 6 miles long in the sky. Expect to see messages from the team leading up to the show and throughout the show promoting the show and their sponsors. The team is looking forward to making their first appearance at the Chicago Air & Water Show. Kapur said "I have been a spectator at the show several times and it will be a thrill for me to perform for Chicago and I am really looking forward to it." You can learn more about the team on Facebook, Twitter, YouTube and via their website. Want to see what it is like to be a member of the Geico Skytypers? Check out their 8 webisodes on YouTube. I earned my Private Pilot Certificate on August 1, 2004. Here is a final summary of the time and costs for me to earn my private pilots license.